You are a special snowflake. There is no other person like you. And now, you have your very own personalized bottle of booze to match. Absolut vodka is taking limited-edition liquor packaging to new extremes with Absolut Unique, a new line of paint-splattered bottles—a staggering 4 million of them—the design of each one a little different from all the rest. At its heart, it's a more brazen but also authentic version of a familiar play to vanity that drives desire for branded collectibles. Usually, a consumer would have to settle for the feeling of exclusivity from having one of a few hundred identical copies of a small-run promotional design. 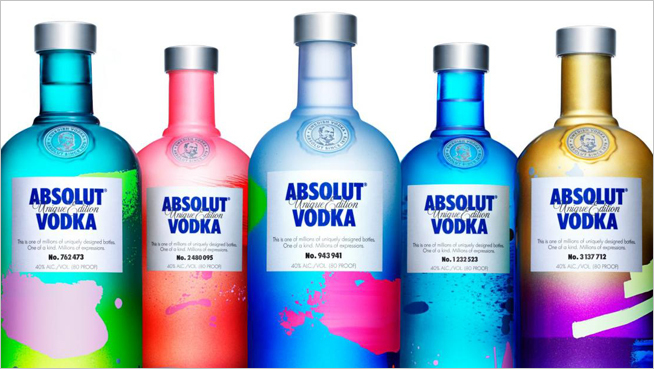 The new Absolut is meant to deliver that same dopamine kick, on steroids. At least, that's the calculus Absolut made in recalibrating its production line for the campaign. The marketing team's behind-the-scenes clip, posted below, casts the concept as a mashup of sci-fi and artsy, focusing on the challenge of programming the machines in the brand's factory to produce different patterns on each bottle, but also patting themselves on the back for cleverly turning them into artists of sorts. The net result: a slight fetishization of technology, and a lot of bottles that the brand is promoting as "a bit mad scientist, and a bit street art," meaning they look as though they were created by a robot Jackson Pollock painting on tie-dye canvas. The execs are so earnest about the project that the promo video ends up feeling a little like a parody of itself. Still, the overall concept is smart, and speaks for itself. As one YouTube commenter put it, "Shut up and take my money!" Overall, though, we have to wonder if the sheer volume of the run, and the consistency of the aesthetic across the bottles, ultimately detracts from its impact. There are so many designs, and the differences among them so slight, do any of them end up feeling that extraordinary?